Margaret ‘Eileen’ Lyons, 95, died on Sunday, February 3, 2019 at Amber Glen Special Care Unit, Urbana. There will be a visitation on Friday, February 8, from 1-2 pm at Owens Funeral Home, 101 N. Elm St, Champaign. The funeral service will follow at 2pm at the funeral home with Rev. Deborah Owen officiating. Burial will be at Woodlawn Cemetery, Urbana. Eileen was born on Jan 7, 1924 in Ashkum, the only daughter of William and Mabel (Brooks) Lyons. She graduated from Kinmundy Community High School in 1942, as valedictorian of her class. Eileen then attended Brown’s Business College in Centralia before beginning her career as a Library Clerk. She retired in 1979 as the Senior Library Clerk at the University of IL, after 36 years of employment. She enjoyed reading, especially mystery novels. In her younger years, Eileen liked to skate and bowl. She was an enthusiastic Illini fan, football and basketball being her favorite sports. Eileen enjoyed music, and sang with the Library Larks until it was disbanded. In community activities, Eileen was a member of the Champaign Junior Women’s Club and she was a charter member of Chats, a social club formed in 1947. 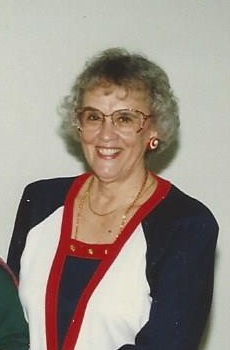 She was preceded in death by her loving brother, William M. Lyons, Jr in June 2017. Eileen is survived by her sister-in-law, Esther Lyons of Champaign; 2 nephews, Michael Lyons of Romeoville and Kevin (Vickie) Lyons of Savoy; 1 niece, Beth Lyons of Peoria; 1 great niece, Ashley Lyons of Montgomery and 3 great-nephews, Nate Lyons of Champaign, Trent (Jaymi) Lyons of Champaign and Martin Lyons of Romeoville. The family would like to thank the staff of Amber Glen and Harbor Light Hospice for their excellent and loving care of Eileen.